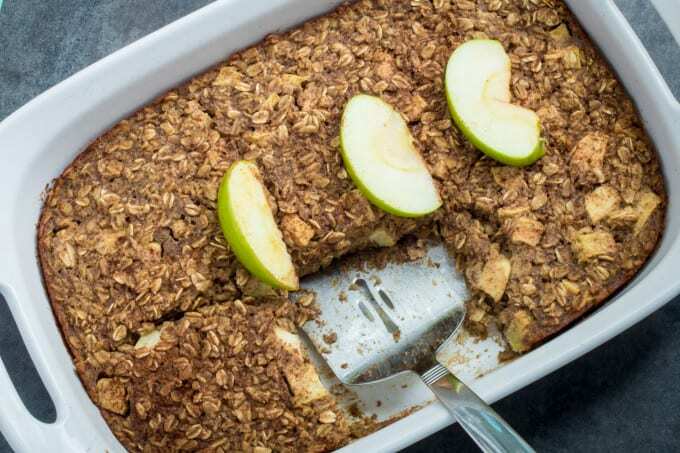 It doesn’t get easier than this Apple Cinnamon Oatmeal Bake! Sweet, spiced, and packed with healthy nutrition, make this traditional dish on a lazy Sunday morning or for your next brunch. 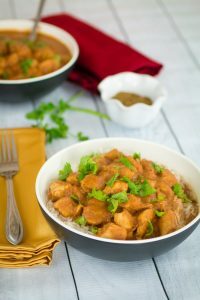 Serve warm and start your day off right with a comforting meal your family will love! As you know, I’m becoming obsessed with fall flavors this year. It was 56°F when I left my house this morning, which means fall weather is officially incoming! 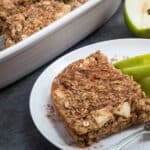 Apple-cinnamon definitely falls into the “fall flavors” category, which is why I’m absolutely in love with this Apple Cinnamon Oatmeal Bake. 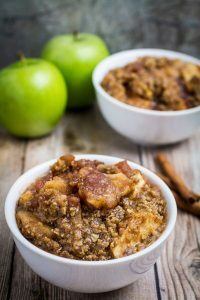 This simple dish has all of the nutrition you would expect from your morning oatmeal, with the sweetness of apples and brown sugar. Not to mention the heavenly cinnamon-sweet aroma that fills your home while it’s cooking. Let’s not forget how incredibly easy it is to make! Impress your family, guests, or even yourself when you pull this out of the oven this the weekend. One of my favorite parts about this oatmeal bake is how versatile it is. Don’t like apples and cinnamon? Ok, add bananas and peanut butter. Or berries and almonds. Or, if you’re a delightful weirdo like my sister, eggs and spices (sorry, I just can’t get on the savory oatmeal train, no matter how much I try). I make this on lazy Sunday mornings, but more often I’ll make it on Sunday night. Once it’s cooled, I portion the oatmeal bake in plastic Ziploc bags and throw them in the freezer. I now have breakfast all week to take to work! If you’re like me and leave the house before the sun comes up, you’ll appreciate this move. 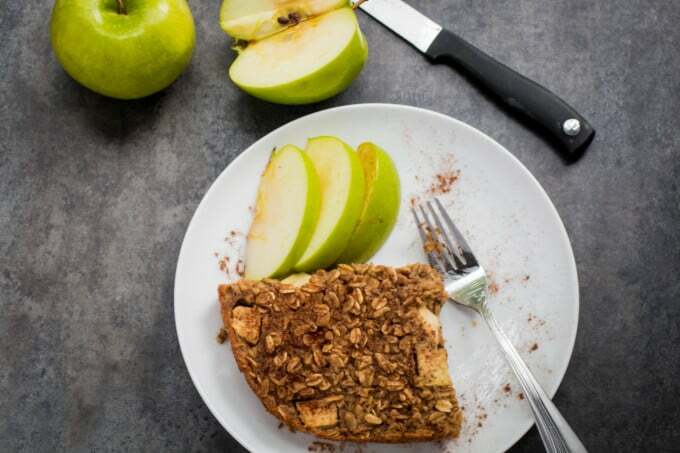 I also like to serve this apple cinnamon oatmeal bake with a touch of honey or maple syrup on top and some fresh fruit. But that’s a personal preference. There’s a lot of debate going around on whether oats are gluten free or not. I buy certified gluten free oats, and recommend them if you need to eat gluten free like myself. YES, pure oats are gluten free. The problem comes in at the farm-level, when the oat fields are contaminated by the rogue wheat or barley stalk. So, if you’re cooking for someone who is gluten free, make sure the oats you buy are certified gluten free. You might also want to make them these Soft Baked Gluten Free Pumpkin Oatmeal Cookies. Because, you know, you love them, and they love cookies. Do you have your own version of oatmeal bake? Let me know in the comments section! 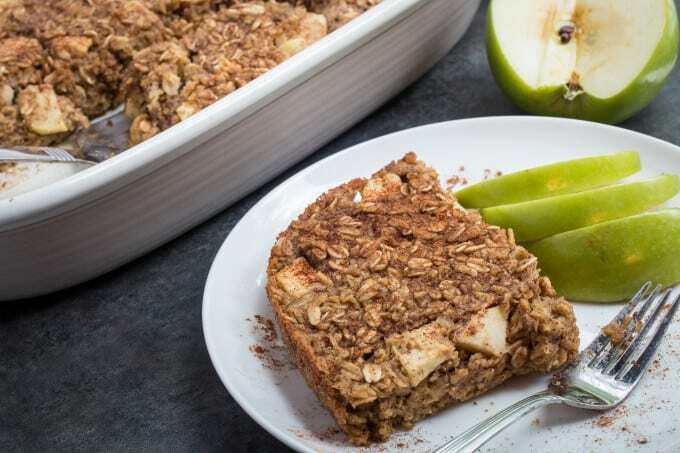 It doesn't get easier than this Apple Cinnamon Oatmeal Bake! Sweet, spiced, and packed with healthy nutrition, make this traditional dish on a lazy Sunday morning or for your next brunch. Serve warm and start your day off right with a comforting meal your family will love! Feel free to add raisins, berries, or any other fruits you'd like. Preheat oven to 350°F. Grease 9-inch baking dish and set aside. Peel, core and dice apples into medium-sized pieces. Set aside. 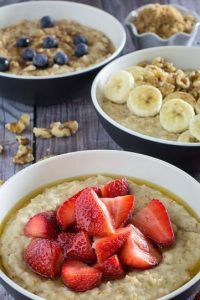 In a mixing bowl stir together dry ingredients (oats, brown sugar, cinnamon, baking powder, salt, nutmeg, and ground cloves). Add diced apples and applesauce. In a separate bowl, whisk together two eggs, vanilla extract, and milk. Add to other ingredients and stir until everything is combined, Pour into baking dish and spread evenly. Bake for 40 minutes and serve warm. Feel free to add any fruit or nuts you'd like to this recipe. I suggest raisins, berries, walnuts or almonds. Chocolate chips would also be great! This dish is also popularly served with milk poured over the top. 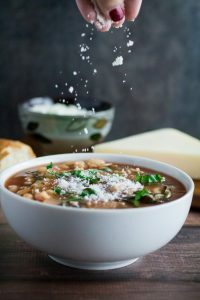 I often make this dish on Sunday night for quick breakfasts during the work week! This looks amazing!! I have some GF oats and apples, so I may need to make his and eat some before the kids get home and attack it like wild animals! Thank you! It makes a nice big dish, it would probably be great for hungry kids to snack on! 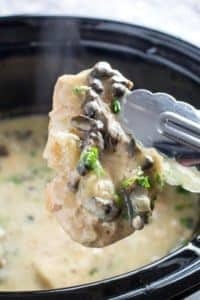 I enjoy your recipes and often want to repost. I’d like to give credit, but find I’ve only copied the recipe. 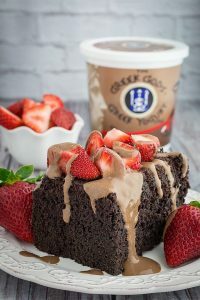 Would you consider putting your website, email address, or link to the recipe just above the ingredients so it is easy to copy and give credit? 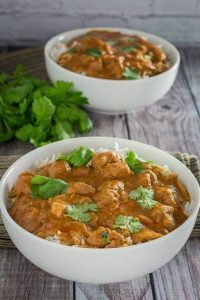 Hi Carol, Thank you for visiting, I’m always happy to hear when people are enjoying my recipes! I’m wondering where you’re reposting the recipe, or is it for your own file? If it’s online I’d love to check it out! 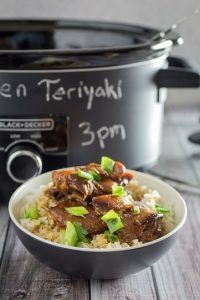 This was super easy and delicious! Made it today for the boy to eat before hockey. I added some cranberries and ground flax seeds. Thanks!